Author and aviator Anne Morrow Lindbergh once wrote, “Travel far, pay no fare . . . a book can take you anywhere.” Especially for children who haven’t yet had the opportunity to travel or see sights beyond their own neighborhoods, books offer an escape to a world that is different from everything else they know. Books can take readers far, far away in a short afternoon, and bring them back in time for supper. 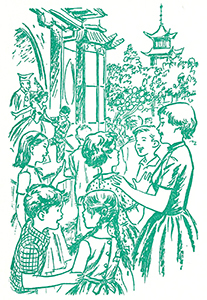 The Happy Hollisters and the Mystery of the Little Mermaid by Jerry West was the first volume in the Happy Hollisters series which took the Hollister family out of the western hemisphere. During their flight to Denmark, the children meet a member of the Danish royal family’s staff who is bringing home a valuable reproduction of the “Little Mermaid,” the famous statue that overlooks the harbor in Copenhagen. Upon landing in Denmark, the statue goes missing, and the sleuthing begins! As Pete, Pam, Holly, Ricky, and Sue search for clues, they crisscross the Danish countryside and explore tourist destinations along the way. One of the most exciting places they visit is Tivoli Gardens. Tivoli contains both an amusement park and ornamental gardens. If you’ve ever been to Disneyland, you know what Tivoli is like; Walt Disney is supposed to have used Tivoli as inspiration for the design of Disneyland! Tivoli was opened in 1843 and it is the second-oldest operating amusement park in the world. The Happy Hollisters have a grand time visiting Tivoli with their new Danish friends, Karen, Astrid, and Nils Clausen. Not only do they ride the “switchback” (rollercoaster) and the “roundabout” (merry-go-round), play games of chance, and eat cotton candy, they also cross paths with the notorious “Mr. Bushyface” who seems to be involved with the missing mermaid figurine. Another day their adventures take them to Christiansborg Castle. This castle served as the residence of the Danish royal family until 1794 and has been used by the Danish parliament since 1849. As the children ride their bicycles through the castle grounds, they encounter a groom exercising the Queen’s horse, Trina, and Pam is delighted to have the opportunity to take a ride! Of course, no visit to Copenhagen would be complete without an excursion to see the Little Mermaid. This bronze statue by Edvard Eriksen, based on the fairy tale by Danish author Hans Christian Andersen, has been a major attraction since 1913. 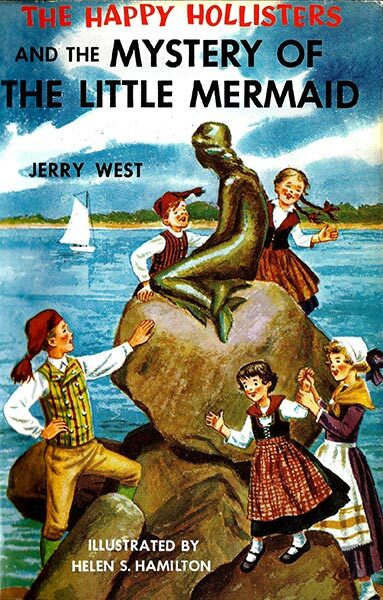 The jacket illustration for The Happy Hollisters and the Mystery of the Little Mermaid shows the Hollister children in Danish costumes, climbing on the statue; since then a fence has been placed around the statue to prohibit climbing and vandalism. The Hollister family’s trip to Denmark is filled with even more exciting adventures and excursions, including sailboat and airplane rides over Øresund strait, a visit to a cheese factory, and ghost hunts at Kronborg Castle. The children also learn about kirkeskibe, which are handcrafted votive ships placed in churches by seamen and shipbuilders and an important clue to solving this mystery. Author Andrew Svenson, who wrote The Happy Hollisters using the pseudonym “Jerry West,” prided himself on including factual, educational details in many of his books. The extensive research he did in Scandinavia gives this book a heartfelt authenticity and truly takes the reader with him on this exciting trip through Denmark. The Happy Hollisters and the Mystery of the Little Mermaid was originally published in hardcover in 1960 and is scheduled for reissue in paperback and digital formats in May 2017.